Huckleberry Lake. Photo by Bill Hill. It's that time of year again; the snow is flying, the geese have (mostly) left. Must be time to consider making a contribution to support Nature Up North! We'd be delighted and appreciative if you made a donation to help environmental education here in the North Country. And more! What would you like to see us do? We're always looking for your input and suggestions! Because Nature Up North is based at St. Lawrence University, your contribution will go through the University -- but fear not, 100% of the donation will go toward our work. To donate, follow this link. 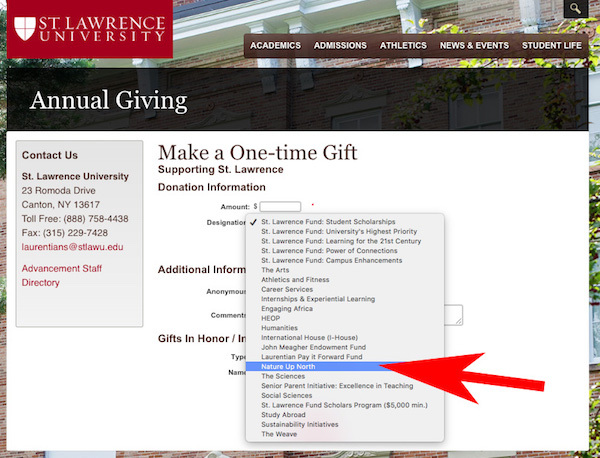 Be sure to choose "Nature Up North" in the drop-down box where you designate the purpose of your gift. We thank you in advance for supporting our work and hope to see you on the trail or at one of our workshops soon! Erika Barthelmess is a vertebrate ecologist and conservation biologist and director of the Nature Up North project. Erika works as a Professor of Biology at St. Lawrence University. Her research interests are broad and include the biology of small, isolated populations, the intersection of behavioral ecology and conservation, road ecology, and the ecology and natural history of porcupines. Erika enjoys hiking, canoeing, camping, and Labrador retrievers.